Here in Georgia, I'm staying with Rich Stewart (canoeist) who lives with his older brother Tyler and Tyler's girlfriend, Jiffy. 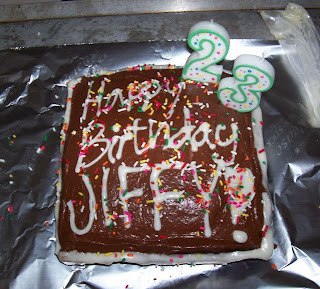 Today is Jiffy's 23rd birthday, and she happens to be the biggest sweetheart in the whole world. And I firmly believe that everyone deserves a cake on his/her birthday. So there was only one thing to do: Rich and I made her a mocha cake! It was quite the labor of love. I called my parents 4 or 5 times in the process to get the recipe right. (I have a bit of a reputation for cooking disasters.) It was funny because my mom was all the way up on top of Bristol Mountain (literally in a cloud, she told me, it was so foggy) watching my little sister Anna race, and I had her reciting the ingredients to me over the phone while I was perusing the local grocery store trying to decide which buttermilk to buy. After a fairly long/intensive day of workouts, it was fun to come back home to rainbow sprinkles, licking spatulas, lighting candles, and surprising Jiffy for her birthday. It also brought back fond memories of baking as kids with our mothers and grandmothers. 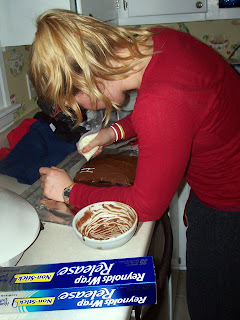 Writing legibly in frosting: no small task! I Have the Best Hometown EVER!